If you’ve not familiar with Thai street food, even the term can be a little confusing – is “street food” food made on the street, bought on the street or eaten on the street? In fact, Thai street food isn’t really all that different from street food at home. You’ve probably bought a hot dog from a vendor and eaten it on a park bench, or got an ice cream cone at the beach during the summer. It's the same idea in Thailand. The big difference between Thai street food and street food back home is that in Thailand street food is everywhere, and most people get at least one of their meals every day from the street. Vendors in Thailand prepare dishes from small stands and often even set up tables and chairs on the sidewalk so you can eat out in the open so you’re not eating on the run. 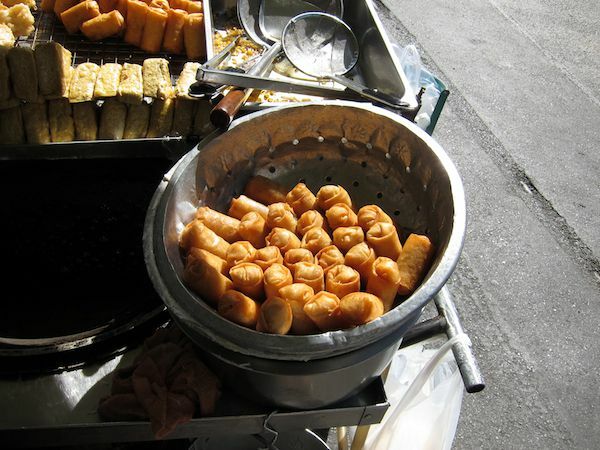 There’s also more variety in Thai street food than just pretzels and ice cream. You can find pad Thai, Thai curries, roti, noodle soup, fried bananas, fruit, papaya salad, fried chicken and just about any other common Thai dish on the street. The food is fresh and fast and a meal will rarely cost you more than 40 baht ($1.30)! Convenience and cost play a role in street food’s popularity in Thailand but tradition and the communal aspect of eating outside are also big factors. Because of this, street food is often of very high quality. Vendors in popular areas compete for customers so the food’s got to be good. With so many choices it's hard to know where to start. If you're visiting Thailand and want to sample as much as you can, try everything! Since dishes are so reasonably priced, you've got nothing to lose.